Do you have super-sensitive skin that makes you extra conscious when you shave every morning? Do you use your shaver with a lot of fear so as not cause any damage or burns to your skin every day? It is time to bid goodbye to your worries with the Philips Series 7000 Electric shavers in your kitty, you can rest assured that your sensitive skin will be taken good care of. 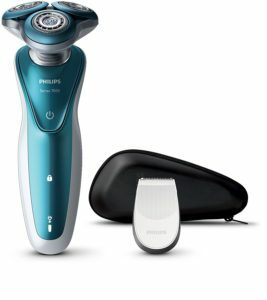 Philips Series 7000 Electric Shaver S7370/12 for Sensitive Skin with Precision Trimmer has been designed exclusively for people who are prone to skin allergies, rashes and other skin injuries due to shaving. Read through our electric shaver to understand the features, pros and cons of this. Can shave quite fast with this razor. Philips has set a huge benchmark with its earlier electric shavers. Therefore, expectations were sky-high on the S7370/12 model as well. This razor may cost a little bit more than a standard electric razor, but if you have very sensitive skin it is one of the top razors on the market. It has 4.1 out of 5 stars with 78% four stars or higher, and 10% a one star. This is a quality sensitive electric shaver.